I made a christmascard today. The image is called Quakers. I like them so I thought Christmas with them is great. Of course there are a lot more images for christmas. Take a look HERE to find them. Who wants a kiss, don't all rush at once, this vision of pure loveliness will be here all Christmas!! I'm Dreaming of a Wide Christmas is available HERE and I am sure every man would love a Deirdery in his stocking, lots to cuddle up to! Don't forget to check out this whole section for all your Christmas digis! This must be my most favourite Dr Digi Stamp - Cuppa. Plus its so easy to use and virtually goes with anything. The perfect accessory! This is one of my favourite images Saturday Night Steven. We all saw those Dad dancer’s and the kids cringing in the corner. In not too many years it will be them up there dancing!! There are so many theories out there, of 'what is the first to go'. After much careful analysis, Prof Dummkopf has determined that the correct answer is.........the 'accurate reporting of one's age'. Works for me....now if only my body could be in on it too! 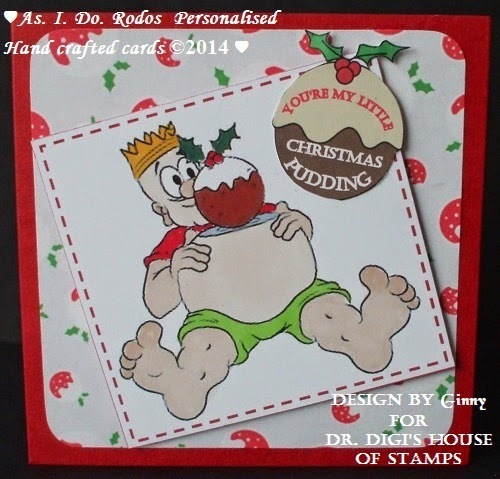 Here we have another fun image from Dr Digi's House of Stamps...just look at that cheeky grin. No it's not the 1st of the month, apparently if you say White Rabbit the minute you wake up on the 1st of each month you will have good luck for the rest of that month, not sure if that is a uniquely British trait or the rest of the world is bonkers too! 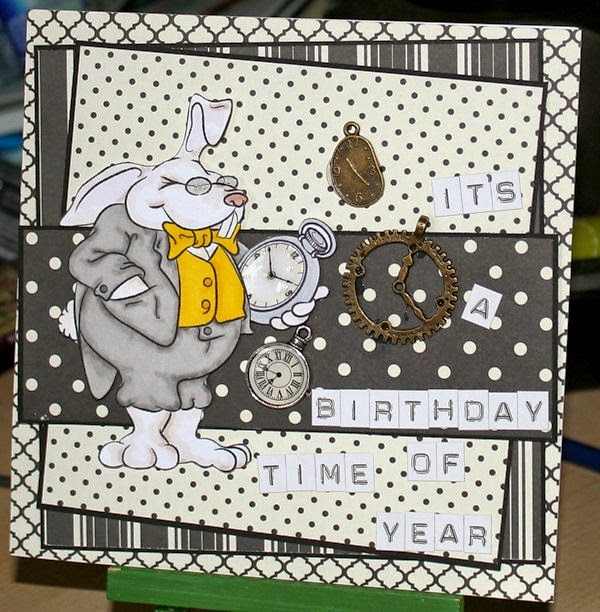 Anyway here's a wonderful new image from the hands of Dr Digi, White Rabbit, he looks a lot calmer here than the original bunny clock watcher in Alice in Wonderland. .... In your case, a really high one. Say what you see! To pinch a catchphrase! Sentiment from the Birthday Sentiment Sheet 01 - just great for when you need something quick. And insulting. With only six weeks to go to the big day (when Santa calls)! We can all sympathise with this poor chap. It’s so hard to say no to these wonderful festive treats. Now do I have brandy butter cream or custard on my pud? Captain Gneng is saying hello. 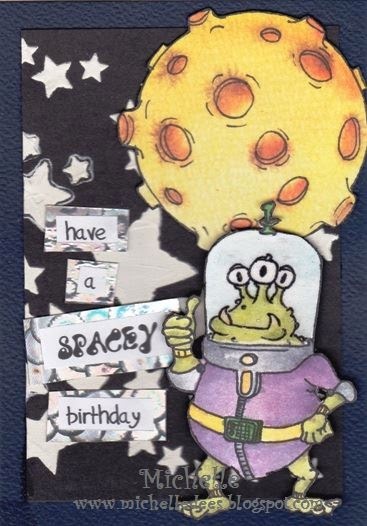 He let us now to have a happy birthday out from space. You find Captain Gneng and the Moon at the shop. So that was my card for today. 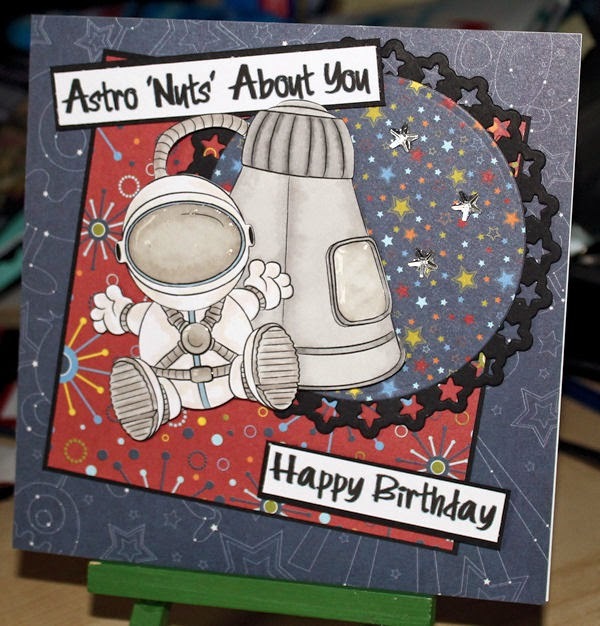 If you want to know how I made the card take a look HERE. Well, he was on a mission, a big mission, he wanted to land on a comet, but unfortunately some spaceship, shaped like washing machine, called Philae got there first! Maybe he will go and dance amongst Saturn's rings instead! Here's hoping your Birthday is a blast! Retro Rocket can fly you to the moon for just £2. And if its the actual moon you want, then that is just a mere £1. 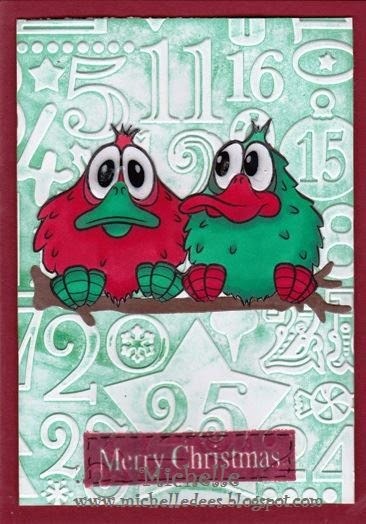 But don't forget the multi-buy deals - all designed to be interglatically lots of fun! He is feeling very sorry for himself he is left hanging there in his court jester outfit! This is a fabulous image for those forgotten birthdays or as I have used it for a speedy recovery and many more occasions. Well, Santa had a fabulous vacation, but now it's time to head back home. He figures on taking the scenic route, with his new bike....let's hope he doesn't get lost! Hmmm, better hope the snow holds off for a bit too. 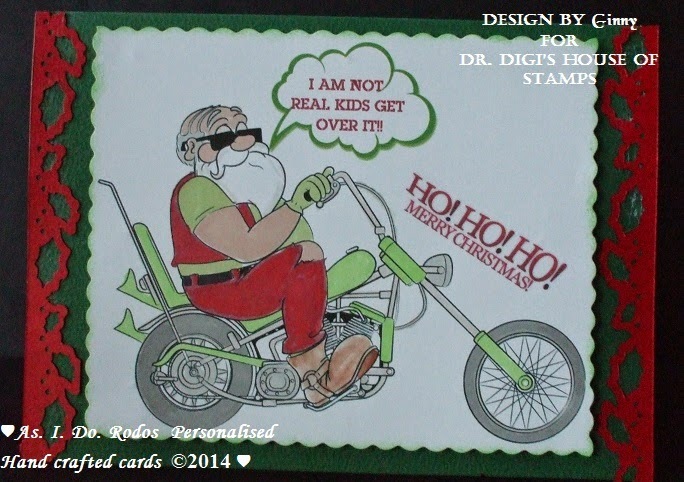 This is another fun Christmas image from Dr Digi's house of Stamps, titled Harley Claus. Something just a little bit different, and lots of fun. 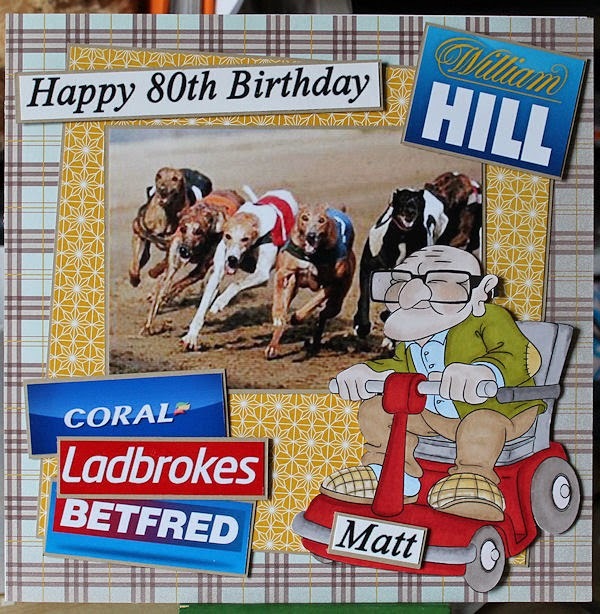 This is one of my favourite images from Dr Digi's House of Stamps, Mobility Malcolm, he is renamed Matt for this card's purposes and as you can see from the card dear old Matt has spent a bit of time down the bookies betting on the dogs or the horses, he is also a much loved Grandad of a wonderful little boy I know. Hope you all have a fantastic weekend, I am off to a wedding, that card was completed a mere 45 minutes ago and I have to leave in ten minutes! 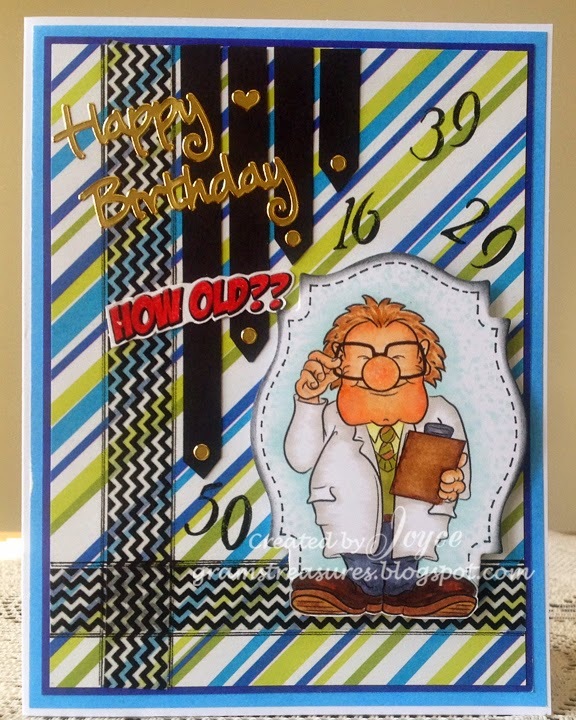 A nice n easy one this week - a simple Happy Birthday. And what more could you want than some candles for the cake you treated yourself to! Sentiment from the very fab Birthday Sentiments Sheet 1. 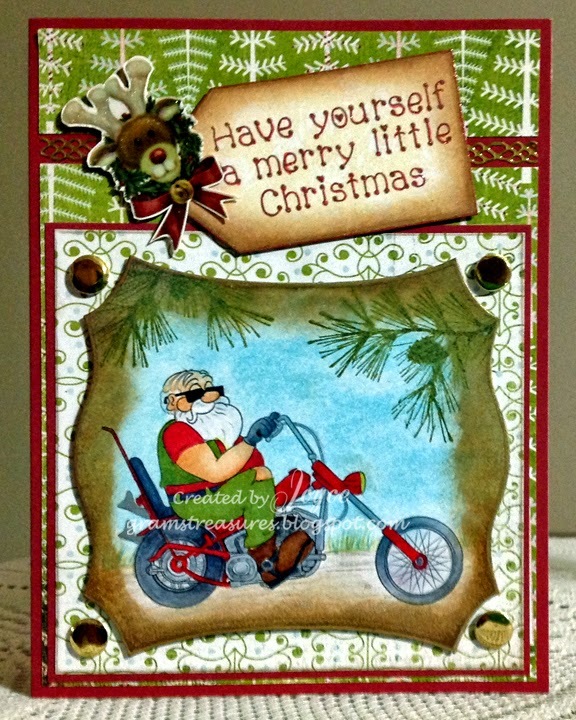 He is off on his Harley to get a few Christmas bargains. Well you didn’t think that he took a sleigh did you? Attention all space cadets! 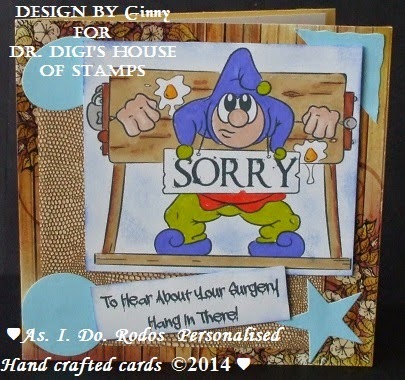 This is Captain Gneng speaking direct from the headquarters of Dr. Digi's House of Stamps. This is to advise you that it won't be long before we will see a big jolly man dressed in red traveling across our galaxy at a high rate of speed. He will be in a sled filled with toys for good boys and girls lead by eight reindeer that will be lively and quick! Therefore, it is ordered and decreed that you will hold your fire and give any and all assistance necessary to aide the traveler in reaching his destinations! 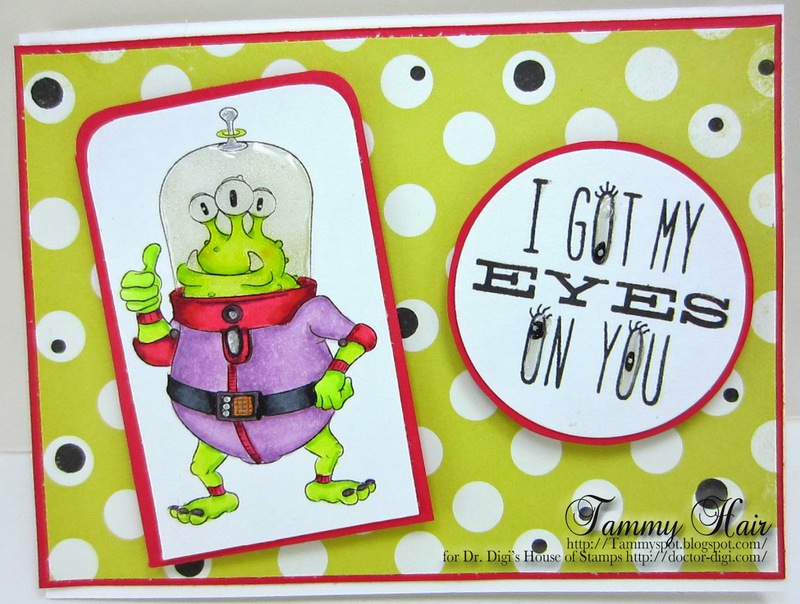 Remember, I got my eyes on you! Over and out! Rocky trained hard to become number one. And at last he did it on his birthday. 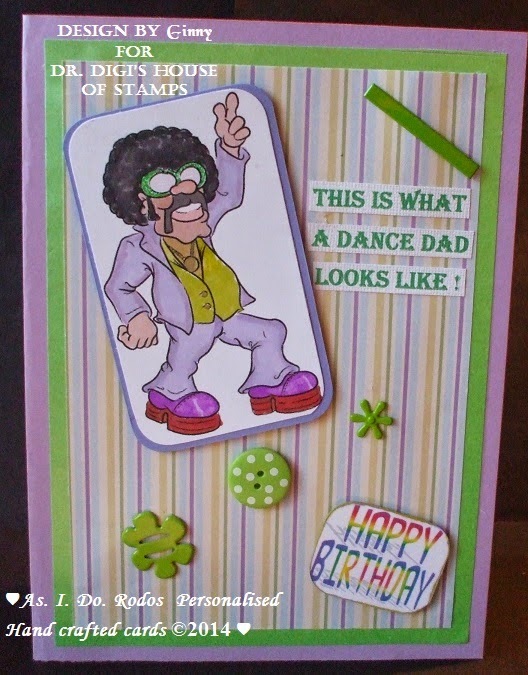 I used Rocky for a male birthday card. I think every men is number one at his birthday. Lovely greetings and have a great weekend.